– مفتاحان رئيسيان يتيحان وحدهما قراءة وفهم كلمة الأمين العام لحزب الله السيد حسن نصرالله في ليلة العاشر من محرم، والرسائل التي أراد توجيهها، بين التصريح والتلميح، لتقع في مكانها الصحيح، الأول هو دعوته المراقبين والكتاب والباحثين إلى ملاحظة معنى نهوض حركة أممية حسينية عابرة للقارات واللغات والقوميات، تتخذ من إحياء مراسم عاشوراء منصة جامعة لها، وصارت حالة ثقافية عالمية متجددة المعاني لمشروع مقاومة ملتزم برفض الفتنة الطائفية والمذهبية، ورافض مشروع الهيمنة الأميركية، ويتخذ القدس هدفاً جامعاً، ويرى في انتصارات المقاومة أملاً وتكريساً للنهج الحسيني بلغته المعاصرة، أما المفتاح الثاني فهو وضع دور حزب الله ومقاومته في قلب قوس أزمات المنطقة كفاعل حاسم غير قابل للكسر والتطويع والتحييد، تحت عنوان مواجهة المشروع الأميركي وإسقاط العدوانية الإسرائيلية، واعتبار هذين الركنين في تحديد دور الحزب والمقاومة أصلاً في فهم نظرته للشؤون الإقليمية واللبنانية، وتفسيراً لدوره في ساحات المواجهة على مساحة المنطقة. – هذان المفتاحان يلزمان مَن يقرأ أبعادهما في خطاب السيد نصرالله، أن يتقبل فكرة اعتبار مشروع المقاومة في طور الصعود الذي يبلغ مراحل متقدمة من إقليميته ويريد ترصيد مكاسبها وصيانتها، وفي طور التأسيس لعالميته وتثبيت مفاهيمها وأبعادها، من الثقافة إلى السياسة أسوة بما حدث في لبنان قبل أكثر من ثلاثين عاماً عندما تحوّلت ساحات عاشوراء إلى قواعد انطلاق للمقاومة. وهذا يعني أن كل مَن يفهم من جزئيات منفصلة في الخطاب دعوات التهدئة ليبني عليها استنتاجاً خاطئاً بأن تلك استجابة لتأثيرات الضغوط سيقع في الاشتباه والوهم. فالتهدئة في ساحات لا تخدم المواجهة فيها مشروع المقاومة ناتجة عن كون المقاومة لا تريد التلهي بالمواجهات الجانبية، لأن لديها الكثير لتفعله في الساحات التي تشكل ميدان ما رسمته لنفسها للمرحلة المقبلة. – يضع السيد نصرالله إطاراً جامعاً لعدد من فقرات خطابه حول أوضاع المنطقة عنوانها ترصيد أرباح الانتصارات من سورية بتثبيت نهاية الحرب وتكريس نصر الدولة السورية برئيسها وجيشها، إلى العراق وتثبيت بنية سياسية ودستورية تقطع الطريق على أعداء مشروع المقاومة، إلى الصمود في اليمن حتى ينتزع مشروع المقاومة حق الشراكة ويكسر العنجهية السعودية المرتكزة على التشجيع الأميركي، وصولاً إلى فلسطين حيث الاستثمار على عائدات المشروع الأميركي لتصفية القضية الفلسطينية، في تنمية مشروع المقاومة وتوحيد المواقف الفلسطينية تحت عنوانه العريض القائم على لا جدوى خيار التفاوض وسقوط مشروع التسوية. Hezbollah Secretary General His Eminence Sayyed Hassan Nasrallah delivered on Thursday a speech that tackled various topics. 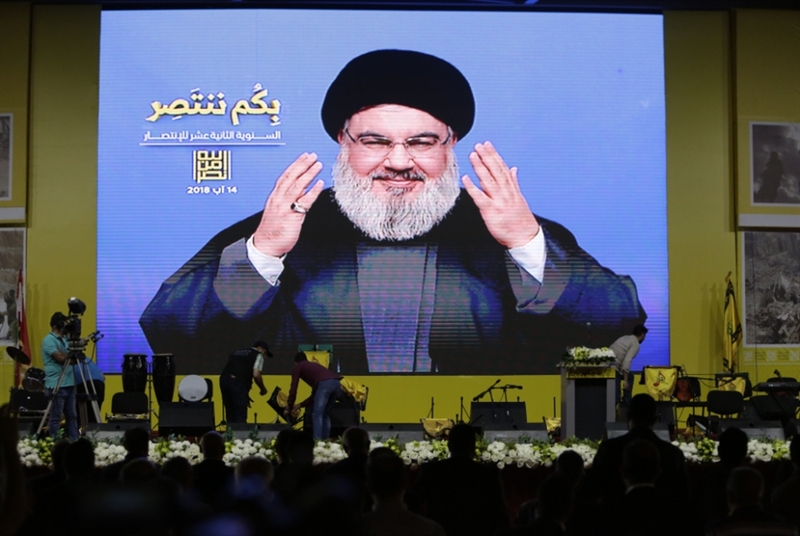 Addressing hundreds of thousands of believers, who poured into streets to commemorate Ashura Imam Hussein [PBUH] in Dahyieh [Southern Suburbs of Beirut], Sayyed Nasrallah renewed Hezbollah’s support to the oppressed Yemeni people. “They [the Yemenis] suffer a continuous Karbala on daily basis . In the war on Yemen, you’ll find the injustice, desolation and thirst of Karbala, You’’ find the nation’s abandonment to Karbala as well as the scenes of strength, heroism and persistence in this battle,” His Eminence said. In parallel, he urged every honorable person in this world to cry and end his silence in face of the heinous crime carried out by the aggression against Yemen. “This silence encourages these murderers and criminals in the US-Saudi alliance to continue their crimes against this Yemeni people,” Sayyed Nasrallah warned. “We were and will remain with the people in Bahrain in their quest for freedom and dignity. We support the Bahraini people, whose scholars and youths have been jailed and suppressed by the Bahraini regime” he added. “America is seeking to sanction Iran because of its adherence to Islam, independence and sovereignty, and because the Islamic Republic refuses to become a slave to the American master. It refuses to allow anyone to loot its money as the case is with other countries in the region,” he mentioned. “Iran was one of the first countries to lend a helping hand to Syria and Iraq in their fight against Daesh [Arabic Acronym for the terrorist “ISIS”/ “ISIL” group],” he said. On the internal Lebanese front, His Eminence called for the continuation of the political calm. He also urged for activating the Parliamentary work. “All sides must carry their responsibility in all files,” Hezbollah Secretary General stressed. “The Zionist enemy used to threaten with invading Beirut in the past. However, this threatening army no longer exists. And in Lebanon, the equation has changed. God has prolonged my life, and this an evidence of your failure as you’ve failed despite your seek in the day and night to kill me,” Sayyed Nasrallah said. This year on Ashura anniversary, Sayyed Nasrallah told the Zionists that all their attempts to prevent Hezbollah from possessing advanced and accurate missiles have been foiled, stressing that the issue “is all over” and that the Israelis themselves can’t imagine their fate if these missiles are used in any future war. 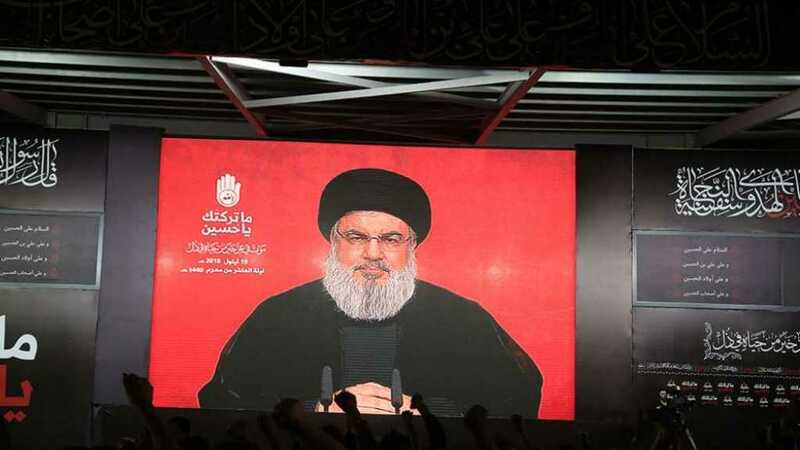 Addressing attendees of Ashura march in Beirut’s southern suburb (Dahiyeh) on Thursday, Sayyed Nasrallah voiced Hezbollah’s stances on several regional and local issues. Sayyed Nasrallah started his speech talking about the occasion. His eminence sent condolences to Imam Mohammad Al-Mahdi (AS) on the martyrdom anniversary of Imam Hussein (AS). Sayyed Nasrallah saluted all those who took part on the Ashura march and ceremonies in the last ten days in Dahiyeh and in other areas across Lebanon. His eminence reiterated Hezbollah and the resistance’s commitment to the path of Imam Hussein, path of dignity, stressing that all sacrifices and victories were achieved due to the commitment to this path and this school. “Imam Hussein’s resounding saying “Never to Humiliation” will last,” Sayyed Nasrallah said. 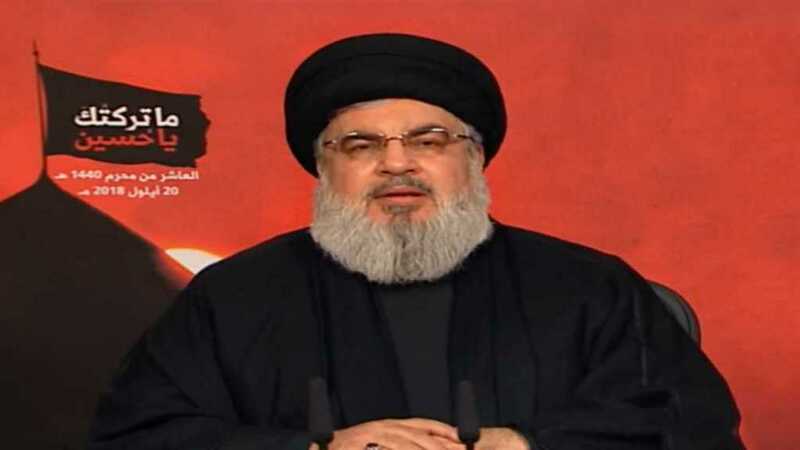 Stressing that the tenth of Muharram is the “day of stances”, Sayyed Nasrallah reiterated Hezbollah’s firm position in supporting people of Palestine, Yemen and Bahrain. “First, we reiterate our ideological commitment to Palestine and Al-Quds. We reiterate our support to Palestinian people and their legitimate rights to confront the so-called ‘deal of century’,” Sayyed Nasrallah said, as he hailed the Return Marches at the border between Gaza and the occupied territories. Third, we reiterate our support to peaceful people of Bahrain whose scholars and youths have been jailed and suppressed by the Bahraini regime,” Sayyed Nasrallah said, as he lashed out at Bahraini regime’s policy of naturalization of foreigners in the country in a bid to make demographic change in the Gulf island. Sayed Nasrallah stressed that “it is our duty to stand by” the Islamic Republic of Iran in face of all kinds of pressures. On Lebanon, Sayyed Nasrallah reiterated the call for calm and dialogue, as well as the call to hasten the formation of the new cabinet. 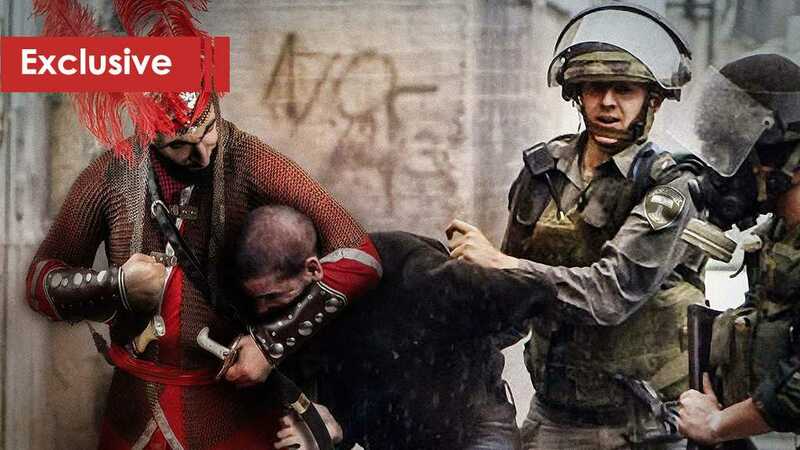 Turning to the struggle with the Zionist entity, Sayyed Nasrallah said that the resistance has to stay on alert, noting that the Israeli enemy has been furious because its scheme in the region has failed. Sayyed Nasrallah cited remarks of Israeli defense minister who talked about strategic changes that took place in the Middle East. Sayyed Nasrallah meanwhile, pointed out to Israeli attempts to prevent Hezbollah from acquiring advanced and accurate missiles in Syria. Filed under: Axis of Resistance, Bahrain, Hezbollah, Iran, Lebanon, Martyrdom, Nasrallah, Palestine, Siege on Yemen, USA, War on Syria, War on Yemen, Yemen, Zionist entity | Tagged: Ashura |	Comments Off on Sayyed Nasrallah to Israelis: It’s All Over… You Can’t Imagine Your Fate in Future War! 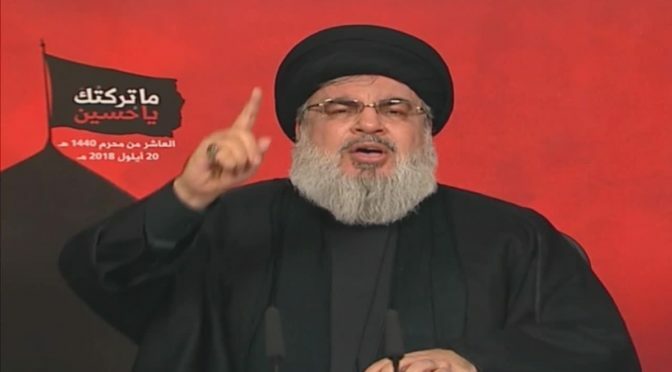 Hezbollah Secretary General His Eminence Sayyed Hassan Nasrallah delivered on Wednesday a speech in which he tackled various Lebanese, regional and international topics. Addressing tens of thousands of mourners commemorating the 10th night of Muharram, Sayyed Nasrallah thanked the Lebanese Army and security forces and all those who contributed to providing the security environment for Ashura. “We-in Hezbollah-look to the American administration as an enemy while some in Lebanon view it as an ally,” His Eminence stated. He further asked the Lebanese who oppose Hezbollah’s stance towards the US administration if they have any evidence to prove that it is a friend of our country. He further slammed the US administration and particularly its National security Advisor John Bolton for threatening the International Criminal Court if it acts against the apartheid “Israeli” entity. “The real ruler in some Arab and Islamic countries is the American ambassador,” Hezbollah Secretary General stressed. “The US interferes in all the internal affairs of the countries, even in the affairs of world powers such as Russia and France,” he said advising all those who want to deal with the US administration as an enemy to pay attention and be cautious. Regarding the deadlock in the Lebanese internal front, His Eminence said that everyone is talking about the seriousness of the situation in Lebanon. “Obstruction and paralysis are engulfing the cabinet formation process and no solution is looming in the horizon,” he stated. Hezbollah Secretary General also urged the Lebanese sides to restore to calm and to resolve the controversial issues via communication and wisdom. “No one can eliminate anyone in Lebanon and we must preserve the atmosphere of dialogue and calm,” Sayyed Nasrallah emphasized. On another level, Sayyed Nasrallah renewed his party’s commitment to all aspects of its electoral program, on top of which is the fight against corruption. “Those who conspire against our region, such as “Israel” and America, and all their allies will not recognize their defeat and our victory,” he mentioned. “Among these pressures are threats of death, war and financial pressure,” Sayyed Nasrallah predicted. However, according to the Resistance Leader, the most dangerous threats are related to the psychological warfare.